July 31st 2018... Here we go again! Not much to report on the signings front as Steve Clarke concentrated on consolidating the squad we had to give us a level of consistency. Ndjoli has been loaned in for six months and seems to have a bit of pace about him, and goals. Millen was brought in as cover for internationalist O’Donnell, but we have not really seen enough of him to pass judgement. Mulumbu remains unattached although he is rumoured to be training with Sunderland (who isn’t these days?) and the manager remains, quite rightly, tight lipped about anyone he is trying to sign, although midfielder Diego Poyet still seems to be training with us. We’ve had a slow start but topped our group in the League Cup and I remain confident that Clarke will continue to get good performances and results from whoever he selects. If you don’t have your season ticket yet now is the time to get it…Killie are back. August 7th 2018... It has been nine years since we took all three points from our opening fixture and despite a slow start on Saturday we reversed that trend in style. The goal, as ever, came from Boyd, only it was defender Scott this time and not Boomer who stuck it away. Ndjoli entered play as a substitute late in the game and scored a sublime effort to seal the win but really it could have been more. We go into week two sitting fourth in the table…or joint top as I like to see it, only one goal off the pace. It looks like we will be signing Austrian goalkeeper Daniel Bachmann from Watford this week but so far there has been no other transfer news; he is only 24 so maybe Steve Clarke sees him as an understudy and not just a back-up to Jamie MacDonald. Remember if you sign up for the Trust or subscribe to TIK before the Hearts game you can win a signed Jamma top! August 14th 2018... You know my mantra by now, any point away from home is a good point, whether it is a good game or not. If the Chris Burke effort had gone in we would be up there with Hearts, but it is still good to be second equal and undefeated going into next week’s cup match against that new lot from Glasgow. News of Lee Erwin heading to Iran came as a bit of a shock but understandable if the reported wage increase is true. He has a fantastic first touch and I think he still has unfinished business at Rugby Park, so if he leaves then it is with our best wishes and hopefully we might see him back one day. I hope Eamon ‘the Wolf’ Brophy now gets a more sustained run in the team…the wee man shoots on sight and seems liable to score at any time. That said, I have no doubt that Steve Clarke may still have an ace up his sleeve. August 21st 2018... A bad day at the office on Sunday and as much as I feel that we held our own for the most part, we probably did not deserve to go through on the day. You can’t win them all unfortunately, and as tough as it is to take it on the chin from the new kid on the block, we just have to pick ourselves up and move on. Social media can be a great thing, the number of debates started and problems solved on the Kickback forums are too numerous to mention, but some fans just take it too far. The players will be the first to admit they didn’t perform as well as we know they can but they don’t need some muppet on Twitter telling them they are not even trying. Jordan Jones had two to three players on him all day, and the one time he got through the ball ended up in the net. Killie fans want him to stay, slating him on a public forum where he engages with fans will not help matters…how about showing some support when we’re down? August 28th 2018... Saturday’s match must go down in the win Collum, for Willie and his ego. Having seen the Gary Dicker incident again I am still clueless as to how that could be construed as a red card offence, yet their goalkeeper lifting his hands and shoving a player over in the box was deemed only worthy of a chat. There are too many other instances to mention, for and against us to be honest, a draw would have been a fairer result in my eyes. In general terms we still seem to be lacking creativity in the midfield areas which is curtailing opportunities up front, the goals are drying up. We know we have the backbone of a good team but the addition of a Mulumbu type player could make a huge difference. Clarke has a real job on his hands persuading players to come here with our pitch and wage budget, we can but hope that his reputation will swing a few deals our way again. September 4th 2018... What a difference a week makes as a refereeing decision goes our way, we have signings galore and we managed a win in the Granite City for the first time in years! With Kris Boyd benched, Eamonn Brophy led the line and was judged to have been impeded early doors, which saw us with a numerical advantage for the wolf’s share of the game. The wee man stroked home a free kick to put us one up and things never looked back. Aaron Tshibola, midfield controller, deputised well for the suspended Gary Dicker and fellow ‘new’ signing Greg Stewart doubled our advantage in the second half with a contender for goal of the season on the counter attack. 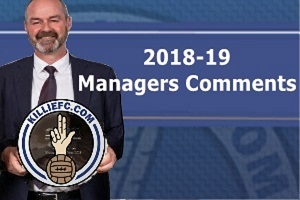 Steve Clarke showed his contempt for the SFA and their disciplinary panel during the week and next in the firing line was our Aberdeen hoodoo, which was also blown away. A big up to the board, the manager, the players and the travelling fans…good to be a Killie. September 11th 2018... It is good to be able to talk about our own players on what is usually an international break for us. Stephen O’Donnell featured in both Scotland’s matches, starting against Albania and was arguably one of the best players on the pitch. I will be very surprised if he has not done enough to retain his place for the Israel game. We had a lot of fans worried about the lack of signings during the transfer window but it would appear that the wealth of talent Steve Clarke now has at his disposal should dispel their fears. We have not even seen some of the new players yet, and both Jack Byrne and Bright Enobakhare come with impressive reputations. With Greg Kiltie, Dom Thomas and Rory Mackenzie also knocking on the manager’s door again, the competition for places is intense. We could struggle a wee bit for a centre half at times but I am sure Clarke will address that in January. It looks like the fears of Boydie's testimonial dinner turning into a Sash Bash were unfounded, which can only auger well for the match to follow. Fans were understandably concerned when the dinner was scheduled to be held in Glasgow and one of the nominated charities was a Rangers one, but reports coming in are favourable from anyone who was there. September 18th 2018... We have complained that much about refereeing and decisions by the SFA of late that I am starting to wonder if we are becoming paranoid or they are all out to get us! Maybe we should not bother playing matches and allow someone at the SFA to decide who is getting the points…Saturday being a case in point. It was a great first half of football, full of highs and lows, but the outcome was settled by a dodgy penalty against us and then not getting a decision at the other end. Fair play to Hibs they are a good side and Mallan is quality addition for them, but we have enough quality of our own to be winning such matches and it is frustrating when we end up feeling cheated. We will win more games than we lose playing like that and it is great to be able to feel that Sunday’s game against Celtic is not a foregone conclusion. It will be tough, but I have faith that we have the players to get a result. September 25th 2018... It appears that my faith paid off in no uncertain terms due to a manager who knows what he is doing and a squad that just won’t give in. We are now unbeaten against the champions in four consecutive matches for the first time since the sixties and for the first time in years the league is looking interesting. I had a good feeling when the ‘Trust in Killie’ History Board was unveiled before the match by Steve Clarke and Trust Chairman Jim Thomson declared that this was only the beginning and better was still to come. And so it did. Aaron Tshibola proved that the manager had opted for the right #27 to sign and Mulumbu blotted his copybook with our fans with a petulant display that saw our respect for him rapidly diminish. It hard to single out players when you put in such a good team performance but Chris Burke was also outstanding, what a work ethic he has, and Stuart Findlay could be the shrewdest signing Clarke made this summer. Their goals were just reward for the effort they put in and their determination to get a result for the mighty was an inspiration to their team mates and the fans watching as well. We saw the best and worst of the Celtic support as they joined with us in a tribute to Tommy Burns in the 51st minute, and then threw smoke bombs on that damaged the pitch and proceeded to wreck seats again. With shocking referees and no control over the so-called big teams…the SFA are a joke. 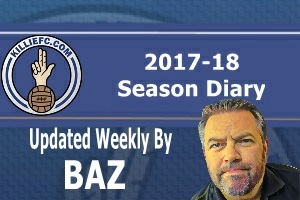 October 2nd 2018... (Killie Hippo Writes) In times gone by Killie's epic win over Celtic would have been followed by a disappointing result against a lesser team but our famous old club under Stevie Clarke is a different animal. Yet again we went a goal down but the spirit and belief is there for all to see and once Jamie MacDonald made a game changing penalty save the outcome appeared almost inevitable. Greg Stewart was a shining light and if he stays fit will play a huge part in what could be a season to remember for Killie fans. The squad seems as strong as ever and with guys like Ndjoli, Boyd, Dicker and Kiltie not even starting we have good quality competition for all positions. The fans have their part to play so I'd urge them to get along in decent numbers and support the best Killie team in many a long year. October 9th 2018... I was offered the chance to accompany Director Cathy Jamieson to Dundee on Saturday due to several other people being on holiday, I’ve never accepted a freebie for Rugby Park but I was not going to say no to a ticket to an away match! It was a strange situation indeed but offered a slightly new perspective on the game and my immediate reaction is…what a fantastic travelling support we have! I can see how the players and directors really appreciate it. So Killie, not having to get out of second gear, win again. Steve Clarke has installed a winning mentality that the players and fans have all bought into. It was clear that Dundee tried to play the ball away from Aaron Tshibola whenever possible and the big man’s frustration led to the incident at the second penalty…not pretty, but to me it shows that everyone is just desperate to play their part. Jordan Jones has had a few critics this season but unfairly if you ask me. Think about it this way, he was a stand out in a poor team, now he’s just fitting in with a team who have improved to his level so he doesn’t’ stand out quite as much. He has not regressed, everyone around him has just got better! The third Kilmarnock FC Hall of Fame Dinner is this coming Friday (12th October) and tickets are still available. A table of 10 costs £500 with the event starting at 7pm. To book for more information please contact – The Killie Shop 01563 545310 or killieclubshop@justsport-group.com Thanks to Hippo for filling in last week…teamwork, it’s how we do things at Killie. October 16th 2018... Gordon Simpson has provided us with some Killie related international stats which I thought worth sharing with no match this week…Joe Nibloe (1929-32) is our most capped Scottish player with eleven, he made five consecutive appearances twice. Bobby Ferguson played six consecutive, with Stephen O’Donnell equalling that last weekend. Ian Durrant made five consecutive appearances in 1999. The most Kilmarnock players capped by Scotland in a single match is three, Mitchell, Agnew & Templeton v Ireland (A) 1908. There is several instances of two: Orr & Campbell v Wales (H) 1892, Mitchell & Templeton v Ireland (A) 1910, Nibloe & Morton v Netherlands (A) in 1929, Forsyth & McGrory v Northern Ireland (H) and Finland (H) both 1964, Ferguson & McGrory v Portugal (H) 1966, Dickson & McLean v N Ireland (A) and Wales (H) both 1970 and McCoist & Durrant v Estonia (H) 1998. Alexei Eremenko played for Finland in nine consecutive internationals although technically he was a Metalist Kharkiv player. Josh Magennis made five consecutive appearances for Northern Ireland in 2015. October 23rd 2018... Killie pick up where we left off prior to the international break with yet another league win. I am starting to think that we should just allow our opposition to score first every week as that is now four in a row of going behind and then taking all three points! Over 1,600 fans in the away end, some in hospitality (the Howard lot) and no doubt some in the home end sitting on their hands enjoyed the occasion to the max and were rewarded with a second half performance worthy of the win. Our fans really seem to be buying into the Steve Clarke effect as much as the players, and tickets were like gold dust as match day approached. Now we have to reach out to all those lapsed and potential fans to start coming to Rugby Park and getting the numbers at home up so we can get some cash in and give the manager options in the next transfer window. October 30th 2018... I am trying hard to think of something nice to say about Hamilton, but they are a horrible lot and offer nothing to the league. I have seen Ross County bring more fans to Rugby Park! This may sound like sour grapes as our winning streak was halted, but fair play to Hamilton, they dug in and got the result they came for. They never even started time wasting until they scored half an hour in, which is twenty minutes later than usual. We huffed and puffed but never really looked like producing the goods as we have in previous weeks. The first five to ten minutes we looked lively but Jordan Jones and Chris Burke especially proved to be a big miss. I was preparing to go down at half time and give Rory Mackenzie money to get a ticket back into the game, he seemed to be getting constantly dragged inside and offered no width. Then he only goes and scores, from a central position, just shows you how little I know about football! November 6th 2018... Well that answers the question of what happens when we score first! You win some, and every so often you actually lose some as well…and more often than not it is at home to Aberdeen. Frustration is the key word this week as we hammered the sheep and yet still came away with nothing for our efforts. Kris Boyd stroked home #135 from the penalty spot and celebrated with some aplomb, but despite almost total dominance we conceded from a deflected effort and a free kick at the death which Jamie MacDonald will not be best pleased at. We were robbed. That said, I feel that Steve Clarke (whisper it) was a bit too slow in making substitutions. Our lone striker was tiring and Aaron Tshibola went off the boil in the second half, both could have been replaced earlier in my opinion. Would that have made a difference, who knows? Also worth mentioning this week…Stuart Findlay’s solid performance…the decent support from the Dons putting Hamilton to even further shame…the fantastic contributions from the Killie fans to the FoodBank...a well fought point from Ibrox. And don’t forget to get your free tickets to the Trust’s Rail Seat Presentation and a chat with Trust and Club Director Cathy Jamieson at the Park Suite this Thursday. November 20th 2018... There were legends aplenty at Rugby Park on Saturday, for the charity match organised by Kris Boyd’s testimonial committee. How good was it to see Alexei Eremenko, Gary Holt and Manuel Pascali back in the stripes? Alan Mahood, Andy McLaren, Garry Hay…there are a few medals in there for sure but, these guys will always have a special affinity with Killie and our fans like nothing more than players with real heart. The main man's goal-scoring record is nothing short of phenomenal and what he has done for us in his three spells has been really appreciated. Not long ago four and half thousand would have been a great crowd for a league match so the attendance figure should not be sniffed at. The match was good natured as you’d expect and it was only a cameo appearance by the lad Novo that stopped the boys in blue getting fecked 6-2 by the famous Ayrshire Killie! It is going to be a big test next week with the two form teams locking horns in Perth, the blue and white army will be on the march...see you there! November 27th 2018... Back to league action on Saturday and it was a potentially tough trip to Perth to take on another form team in St Johnstone who had won five on the bounce, conceding no goals in the process. Well they didn’t lose any further goals but they did drop points for the first time in a long while as Daniel Bachmann claimed his second clean sheet. A draw was probably a fair result although Killie no doubt edged the second half and could have claimed another scalp on the road. You know what I say about a point away from home though. Looking forward to seeing Brophy back and getting the squad back to full strength, we miss his wolf-like tenacity and shooting from anywhere! We will keep plugging away and if will be fantastic if we can stay in the mix through a hectic December schedule. Keep backing the team and keep the faith. December 4th 2018... Two points off the top going into Wednesday’s match against Livingston, and looking every bit like challengers, unbelievable from Steve Clarke and his squad. Saturday could have been a complete whitewash, if there hadn’t been a couple of blackouts! We took the game to Hibs from the outset and Eamon ‘Wolf’ Brophy did not take long to mark his return with a fine effort to put us in front...as predicted last week. The industrious #25 doubled his tally from the spot and probably would have had a hat-trick had the manager not made a tactical switch and substitute him for Aaron Tshibola. Greg Stewart closed it out in the end and another clean sheet from Daniel Bachmann secured the win. The power cut, which obviously upset the rhythm on the game, was amusing at first, but there were a lot of anxious faces when the lights went out a second time. Ironically Alan Power was probably our man of the match, and it would have been very handy to have Bright on the bench under the circumstances! December 11th 2018... Six points from nine is a reasonable return from the last three matches and I don’t think anyone will argue with that. We trounced Livingston during the week and then got the same treatment ourselves on Saturday. Taking on the current champions in their own back yard is never going to be easy but with no wins against us in four so far, they were definitely out to prove something. And so it was, they were pretty much unplayable in the first half and when Jordan Jones missed the chance to equalise and they ran up the park and score their second, it was a damage limitation exercise. Gary Dicker was performing well and SOD always looks like one of the best right backs in the league, but too many of our lads were looking a bit subdued. Steve Clarke made changes at half time and steadied the ship, managing to ‘draw’ the second half, but the damage had been done and sometimes you just have to take it on the chin. Down to second place, shocking eh! Steve’s after match comments were spot on as usual, we have a small squad who have been performing at a very high level, they could do with a wee rest but there’s no real let up until the winter break. The away end sold out once more, the fans were magnificent, bring on Dundee and we go again. December 18th 2018... We started with what could probably be described as our strongest team on Saturday but the first half still proved to be a struggle. We had the upper hand in terms of possession and positive play, but Dundee had a few chances themselves and Bachmann proved his worth in keeping the score level. The second half proved to be a different prospect and the bottom side just couldn’t live with us, we could have scored a lot more than the three we did. The win fired us back to the top of the table again, albeit just for a day, but we are getting kind of blasé about it now! There is no reason we can’t still be in a challenging position after the winter break if we continue to play to our strengths, regardless of the opposition. There are no easy matches, but no one wants to play us anymore and that fear factor could be to our advantage. When you are writing your letter to Santa, please give Greg Stewart a mention. December 25th 2018... I have spent a couple of days considering ways that I could describe how I feel about Hamilton Accies, only to come to the conclusion that the less said the better. Time wasting is a black art for that lot, and they have now added hammer throwing to their portfolio, although for the most part they only succeeded in injuring themselves. To be fair we should have been able to overcome their ‘style’ of play, but we never really clicked on the day and we had to settle for a point. I do find it difficult to be fair when the likes of Dougie Imrie throws himself to the ground like he’s been shot in the face, trying to get one of ours sent off, but it is Christmas after all, so I’ll settle for casual indifference and looking forward, not back. We’re still in the mix (five points clear in fourth place) and we’ve still got the best away support in the league, have a great Christmas and I’ll see you at Motherwell. December 28th 2018... We carried a fantastic support to Motherwell and were rewarded with another three points. As it stands we are right up there among the contenders and just one more match to go before the winter break…a fantastic effort from all concerned. The big debate now on the forums is what result we would like to see in the Glasgow derby match on Saturday before we take on St Mirren at Rugby Park. Some would like to see Celtic win so we can jump Rangers into second place, some would like to see Rangers win to keep both of them close…and the smart money is on the draw as then they both only gain one point instead of one of them getting three. Personally I don’t really care what the result is…the only thing that matters to me is that we do our bit and get a result over the Buddies! Drag anyone and everyone along to this one that you can, if we can emulate our away support at home then the players will get all the backing they need. January 1st 2019... Our fans turned out in numbers for the match against St Mirren, and the Buddie’s Paul McGinn left Kilmarnock red faced and pointless. Over six thousand cheered on the mighty to end a glorious calendar year with more points than any other top flight team in the country…which won’t win any prizes but something we should be proud of nonetheless. It’s a wonderful achievement and as we go into the winter break we should continue singing the praises of the management team, the squad of players, the board of directors and last, but certainly not least…the fans. It was great to see the Park Suite rocking again with the Paninaros out in force in tribute to their old brother in arms Guinea. I’m calling the East v West song battle a score draw as there were no losers on the day and with the team sitting third, only one point behind the twisted sisters, I think we are all going to have a pretty good New Year! January 8th 2019... This week’s offering should really be all about Scotland’s oldest professional football club’s 150th anniversary launch dinner on Saturday, organised by the KFCSA and Killie’s Gregg McEwan, but sadly that is not the hottest topic this week. We already knew that Jordan Jones would probably be leaving the club at the end of the season, we also knew it was highly likely that he would go up the road to Rangers (boyhood heroes my arse), we didn’t like it but it happens, you lose players and move on. The immature and classless way it transpired though was unacceptable and insulting to the fans and club who gave the player the platform to shine which facilitated his move. Such a shame as Jones has been an excellent player for us and up until now, really good with the fans. Why any of these guys would choose to align themselves with lowlife factions via the medium of social media is beyond me! Seems like The Rangers are up to their old tricks of buying out their nearest rivals again, surely the SFA must have something to say about such a recently bankrupt organisation already back in massive debt and losing money hand over fist? Don’t hold your breath. January 22nd 2019... The winter break was not good to us as our rivals seem to have adopted a “if you can’t beat them, sign them” tactic for the run in. You’d think Sevco would at least be wary of trying to buy league places after their recent come back from the dead! If the scrappy win over Forfar proved anything, it was that Greg Stewart will be a far bigger loss to the team than Jordan Jones, but no one is irreplaceable. Jones himself was replaced in the 65th minute, and the Killie fans who had been warned not to boo him, ripped into his “boyhood heroes” instead...apologies to Middlesbrough. Clever. The only rocket really worth talking about is Stuart Findlay’s left foot one for the first goal! We lined up with an almost unrecognisable defence and the big yin still has time to stroll up the park and bang one in. There are tough times ahead but if we stick together and back the team we’ll keep ourselves in the running…and at least we never drew the all-conquering Talbot in the next round of the cup! January 29th 2019... Two points would have been a good return from the last two matches so it was fantastic to come away with four. All the talk was about Jordan Jones prior to the midweek match and our opposition started Jermaine Defoe who is paid more than our whole team put together! He did get a goal, but the best team won on the night and fair play to Jones who got the winner and vindicated his selection by the manager. I said on the radio at the time that the only man who could fix the problem was Steve Clarke, and he did, with some wry humour thrown in by the Killie faithful. Now we know he’s still up for the job, time to move on. Next up some resolute defending meant a clean sheet and a point from Pittodrie. How Kris Boyd got sent off for his (yellow at most) challenge and yet the dirty Dons got away with the two footed tackle on Aaron Tshibola and the elbow in Scott Boyd’s face…only Nick Walsh will know. Big game on Friday night, let’s show up in numbers! February 5th 2019... I remember what it feels like to lose now, and it is not a nice feeling. The big difference now though is that even when we conceded the second goal, at no point did I consider that we might not at least peg them back for a draw. As it turns out we never, and our title aspirations took a large dent, but we have new fuel in the tank and the juggernaut will roll on. Steve Clarke toyed with us as usual and stayed tight lipped about potential signings, then brings in a striker, Liam Millar, from Liverpool and paves the way for the prodigal son, Youssouf Mulumbu, to return. Wednesday at Dundee might be too soon for our latest acquisitions to make a serious impact but hopefully they will feature at some point. We missed the bite of the Wolf, Eamon Brophy, up front on Friday with a minor hamstring problem, fingers crossed that he will be back on the prowl sooner rather than later. February 12th 2019... Talk about a game of two halves! We got off to a terrible start midweek in Dundee and although Conor McAleny’s equaliser was a peach, we were guilty of some schoolboy defending. The Broadfoot/Findlay partnership was a wee bit rusty with big Kirk being out recently, and to be fair they did not get much help from the midfield. The second half saw us back to our best but a free kick into the top bin from Killie’s own Benjamin Button, Chris Burke, was as much as we could muster in goals terms, despite our dominance. A decent point away from home and it was to be another deserved draw in the Scottish Cup on Saturday against The Rangers. That will be seven times we get to play them this season, surely time for league restructure? Steve Clarke has quite rightly been calling for some refereeing consistency in the press. Sevco boss Slippy Gerrard assumed the comments were about his team and let fly with insults. He could clearly learn a thing or two about class and decorum from a professional like Clarke. Speaking of class, a quick mention for Daniel Bachmann for saving not one but two penalty kicks in back to back matches, the big man waited his turn and he oozes confidence and gives real steel to our back line. February 19th 2019... The focus on artificial pitches is getting beyond a joke. The facts are that the majority of teams train on them, the majority of young players are fine with them and statistically it has been scientifically proven that you are no more likely to get injured on a synthetic surface than you are on grass. 100% of the people we polled agreed that synthetic pitches are absolutely fine (small print: we only polled players from Killie, Hamilton, Livi and employees of FieldTurf). It would seem that Celtic have no problem with our pitch at all, certainly their fans didn’t when they invaded it after getting a lucky deflection in the last minute of the game on Sunday. Not even mentioned on the telly or radio, unsurprisingly, as the thuggish behaviour of Scott Brown transferred seamlessly to the stands. Coins thrown at Kris Boyd, fans running the length of the pitch for selfies, violence in the streets after the game…will the SFA or SPFL take any action? Absolutely no chance. February 26th 2019... It is all about the Killie in the media these days, sadly not much of it is anything we really want to hear about. The cup replay never really went to plan, our plan that is. Eamon Brophy gets denied a stonewaller, Sevco run up the park and score. Daniel Bachmann gets sent off for brushing off a defender, later rescinded of course when it is no use to us, and then we lost Alex Bruce to injury and had to put a midfielder in defence. Understandably we were then overrun and the joy of the home support manifested itself in sectarian chanting directed at Steve Clarke. The big man was shaking with anger at the post match presser, quite rightly too, cheated, abused and knowing fine well it would get swept under the carpet as it always does. The Rangers Football Club officially apologised via Dave King latterly, but their fans just laughed it off and kept it up for their next match. Obsessed? Come the Saturday we were all looking to get back to football at Livingston, but a decimated team never quite got going and despite hitting the woodwork three times we lost out to a single goal and the three points eluded us again. Nice to see about twenty Kaiserslautern fans over for a visit and also the new "Now we have a leader" banner making its debut...great support from the fans yet again. It has been a tough spell and injuries and suspensions have hit really badly, but if this is as bad as it gets, and we are still sitting fourth in the table, then there is nothing to worry about, it has still been a great season and it is not over yet. March 5th 2019... There has been constant chat about the game which was abandoned last week, by most of whom if brains were dynamite they would not have enough to blow their nose. Embarrassing rants about how the re-arranged match should have been free and how it was a disgrace to charge a fiver entry…I’m sorry but in my opinion it was the best deal for an SPFL match ever! The fog was not down to the club, and they had to fork out for an unscheduled fixture on the Saturday…when we’d asked Motherwell to play it in the first place and they refused. If you swap it around we actually paid £5 for half a match and then £22 for the whole thing…I’ve never heard of cheaper. The game itself was a bit of a let-down but we were much improved second time around and were unlucky not to shade it. Five games without a goal, Sevco and the Dons have certainly upset our balance with their transfer window shenanigans, as planned; our wee trip to Tenerife will hopefully give us a much needed boost. March 12th 2019... It was a tough match at Paisley and massive credit to the players of both sides who tried their best in terrible conditions. While I do not like singling out individual players for praise I think I can get around that by praising them all! Daniel Bachmann is totally solid, he gives the defence such confidence and has been outstanding since replacing Jamie MacDonald, who is no slouch himself. Stuart Findlay should be getting serious consideration for a call up and was immense on the night backed up by Kirk Broadfoot, Stephen O’Donnell and Greg Taylor. Gary Dicker and Alan Power are a combination that is difficult to beat, literally, and the sheer tenacity and determination of Chris Burke and Eamon Brophy gives me goose bumps. That only leaves a couple of places to play for and fortunately the boss has a few options. Most pleasing was another fantastic away support and the reaction by the players at the end of the game reassuringly tells me that they are as invested in Killie as we are. Bring on the cheats. March 17th 2019... Due to circumstances I found myself having to seek out a bar in Manhattan to watch the game on Saturday, and that wasn’t easy as the St Patrick’s day parade had started. There is a Sevco supporters club on the upper east side though, which was risky, but better than no game at all. Ten of them, one of me, outnumbered as usual but I fancied our chances! An early injury to Eamon Brophy was a setback, but his replacement Conor McAleny had the presence of mind to slip past their defence and put us ahead. At half time they wanted $10 for watching the game so I gave them $20 and told them to invest the rest in a goalie. They did equalise eventually, but we had our tactics right and possession football saw us leave with a well-deserved point. There were a few meaty challenges by both teams but Steve Gerrard’s knicker wetting is just sour grapes. Well done to big Stuart Findlay on getting called up to join Steven O’Donnell in the Scotland squad. March 26th 2019... Steven O’Donnell gained another cap against San Marino after both our players only made the bench for the Kazakhstan debacle. Stuart Findlay inexplicably missed out altogether in the later match, where we had two goalies on the bench, I really hope he is not injured! Another strange one was Jordan Jones putting in decent performances for Northern Ireland despite failing to show for us in recent weeks, maybe the break will do him good? Off the field there are many changes happening. The gym is being closed and sold off, which is a real shame for the employees but understandable as it has never made a profit for the Club. In turn our offices have been moved to Portland Road as the Board start re-organising and getting our house in order now that the stench of our former chairman has finally left the building. We owe much to the current Board and also John Kiltie and Bill White for where we find ourselves now, hopefully this is a new beginning and we will see more get involved soon. April 2nd 2019... A five star performance with five unanswered goals from five different players…this is how it feels to be Killie! While Hamilton were not the same side who recently beat Aberdeen and Hearts, the score line actually flattered them as we could have hit double figures on the day. That said, the QTS Man of the Match sponsors must have over indulged in the hospitality to award their accolade to Youssef Mulumbu. While the on-loan midfielder was back to his ‘ball-sticking-to-his-feet’ best, Rory Mackenzie totally bossed the whole game and it was a travesty he did not get on the score sheet. The worrying thing for our opponents must be that two of our best players, Alan Power and Chris Burke, didn’t even start the game. Rugby Park’s own Benjamin Button did get a cameo, and a goal, but there is no denying the Steve Clarke got his players and his tactics right on the day…at times it looked like Greg ‘goal-machine’ Taylor was on another planet! Hibs are a different prospect though, and no doubt the boss will switch things up to suit. All we can do is travel in numbers and get behind the team who, sitting in third place with only seven games to play, are well worthy of the support. It’s great to see the crowds up 10% on last year but we have to keep trying to bring more people along to watch the magnificent football that is on offer at Rugby Park. 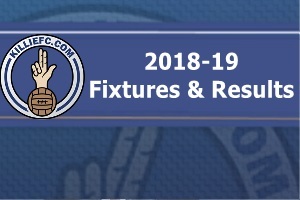 The Club is undergoing major reconstruction on and off the park and getting a few more bodies into the ground as a result would be a real vindication for the time and effort put in by everyone at the Club and would hopefully encourage more investment in Killie. The Player of the Year Dance is at the Park Hotel next week, a bit early as always in my own opinion but I understand they want to have it while players are still here…check with SLO Allen Kyle for any remaining tickets. April 9th 2019... Another great support through from the fans and a decent away point midweek at Easter Road, if anyone was going to win it in the end it was us. The Saints game on Saturday was testament to just how far we’ve progressed, at no point did we look under pressure and we should have scored more goals. Kris Boyd just missed with a header, won and scored a penalty and had a perfectly good goal disallowed. That’s now 136 overall and 121 goals in the league, tying him with Eddie Morrison in second place…illustrious company indeed! Rory McKenzie was again outstanding, and it is great to have someone who can take corners again! Only one goal conceded in the last six matches says much about our defence, and even an absolute keeker to his right eye couldn’t keep big Findlay down. Every match is now vital, and although there is much talk about the zombies game and giving them one stand, let's concentrate on getting as many as we can to the Aberdeen game first. A well-deserved win for Alan Power at the KFCSA Player of the year awards, running away with the title with a record number of points. Young Player of the Year went to Greg Taylor and Burkey and the Ginger Boyd picked up awards from the KFCDSA. April 16th 2019... The latest date added to the sesquicentennial calendar is Saturday 7th September which will see the #Killie150 Legends (working title!) night take place in the Grand Hall. The Trust and SLO are currently working on the details but it made sense to get the date out there. It’s an international weekend with no Killie fixture, and Scotland are at home on the Friday and Monday so nobody should miss out. The event will be informal, it’s not a black tie event, more a blue scarf event…although we’re drawing the line at jeans or trackies! There will be entertainment of various sorts, but in the main it will be a dance and the live band will cover music from several decades…with top chef Alasdair Hood doing a finger buffet for each table. Jimmy McGuire will host and we are inviting dozens of Killie legends to come and enjoy the night as well. Ticket details will be released soon, and we will be making an effort to ensure that as many fans as possible get the chance to attend. The big news of the week appears to be the fact that we are only allocating Glasgow’s new boys the Chadwick Stand, the same stand we give to every other away team, for the last game of the season. The inevitable reaction was calls for a boycott and only to take one stand again next season, which is a bit presumptuous as they better wait and see what is on offer. Clearly they think this is all about them, when in truth of course it is not. This is a brave decision by the Kilmarnock Board to put people before profit and giving the fans what we have been asking for…home advantage at Rugby Park. We will probably not fill the three remaining stands, why would anyone think we would, but at least we are going to give it a go and hopefully a less intimidating atmosphere will bring more people to the match. Our job now is to back the Club’s decision and get as many bums on seats as possible, and that goes for the other two home games as well, not just the final one! April 23rd 2019... Straight away I am going to say that even with eleven players on the park I don’t think we would have won the match against Aberdeen, a draw would have been a fair result on the basis of a turgid first half. That of course is before introducing the McLean factor into the equation…we should have let Shinnie just referee the game! A lot of the media opinion is based on watching ‘highlights’ but only those there will understand just how badly the whole game was handled. Cosgrove and possibly Devlin should have walked, game changers right there for starters. It was a clumsy challenge from big Kirk but he’d get slaughtered if he never went for it; a brave save from Joe Lewis but then he goes down holding his face despite not being touched. Next the Aberdeen players, despite what McInnes claims, surround the referee and make sure the card is a red one. Broaders eyes were clearly on the ball, very harsh in my opinion but McLean didn’t need much persuading from the sheep. Stuart Findlay’s wasn’t so clean cut, he definitely gets something on the ball, we have to accept the second yellow for that, but did he deserve the first one? Kris Boyd comes on and gets booked for a 50/50 challenge before touching the ball, literally two minutes later a Dons player gets away with the exact same thing. I would say McLean had lost control by then but truth be told he never had control in the first place. The final insult was the sending off of Rory McKenzie; he retaliates after being elbowed and head butted on the leg, yet Ball gets away with it completely. The stats tell us that Killie were guilty of 18 fouls, Aberdeen 22, you'd never have guessed that based on the card count! Steve Clarke will be in trouble next after his post-match comments…despite speaking the truth the SFA will close ranks and protect their own. It is the reputation of our game they are supposed to be protecting and yet they will say it is us that is making it look bad for indiscipline, the lunatics are still firmly in charge at the asylum.